What is a Medicare Supplement Plan D? Medicare Supplement Plan D, what is it? In this article, we’ll take a quick look at Medicare Supplement Plan D to see whether it is worth investing in over other plans. If you are confused at which Medicare Supplement would be the best fit for you, call 844-528-8688 for a free no obligation consultation. You can see a break down on the Medicare Supplement Plan D benefits by continuing to read this article. Medicare recipients who are looking for a way to cover the “gaps” in their Original Medicare can turn to Medicare supplemental insurance for reprieve from costly copays, deductibles, and coinsurance. While these Medigap plans come with an additional monthly premium, most people are happy to pay a predictable extra amount for the peace of mind that they won’t be hit with unexpected fees. See our Medicare Supplement breakdown of all the plans available HERE. The terminology with Medicare can get confusing, to say the least. It’s important not to confuse Medicare Part D with the Medicare Supplement Plan D. They are two distinct offerings paid for separately. You can have one, both, or neither of them. Medicare Part D is a prescription drug plan that allows you to pay reduced costs for qualified medications. 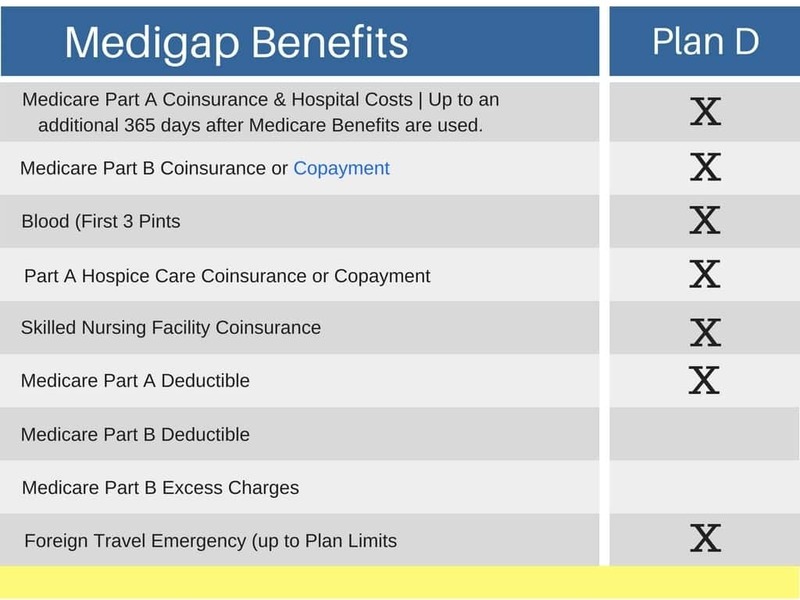 Medigap Plan D is one of ten supplemental insurance plans that extend the typical benefits you receive from Medicare. Who Is Medicare Supplement Plan D Best For? Part B Excess Charges refer to the 15% above Medicare’s “assigned fee” that doctors in most states are permitted to charge. The patient is responsible for covering these charges unless they’ve got a Medigap plan that covers them. Unfortunately Plan D does not. So, you might be interested in Plan D if you are okay with the potential of paying extra fees from your doctor or if you know that your favored providers don’t charge above Medicare’s prices. Medicare Supplement Plan D is not one of the most popular plans among those seeking additional coverage. While it covers some of the most commonly sought after benefits of Medigap, the monthly premiums don’t usually justify the cost. For those looking at the type of coverage offered by Medigap D, you are usually better served by Plan N. Plan N offers virtually the same coverage, but at a lower monthly premium. The only downside is that you are required to pay a copay for some office and emergency room visits. However, unless you are visiting the doctor or ER many times per month, you usually save money with Plan N.
Not Sure About Which Medicare Supplement Is Best For You? It’s not always easy to compare all of the different Medigap plans. We’ve been helping people just like you for years to cut through the confusing numbers and letters of Medicare and find a plan that fits their lifestyle and their budget. Give us a call today at 844-528-8688 or get in touch on our online contact form. We’d love the chance to help you get started with Medicare Supplement, and our services are 100% free.